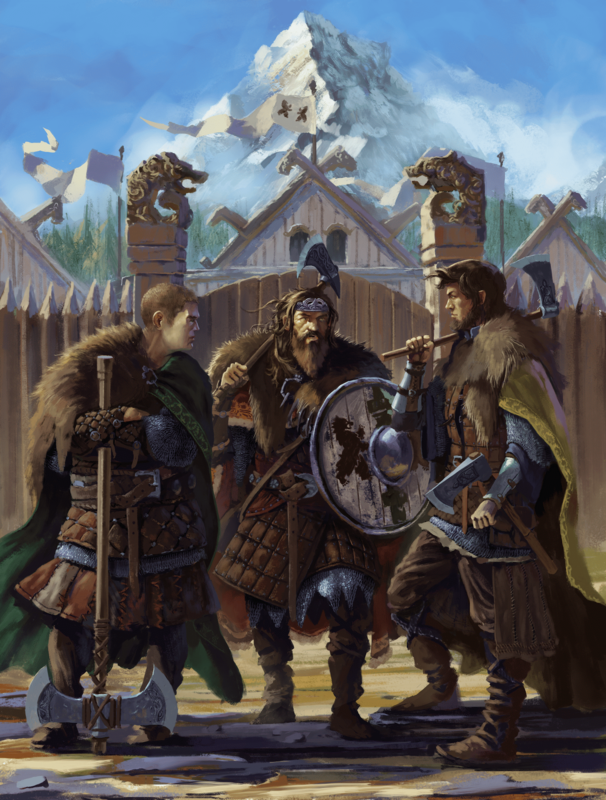 The Grand Duchy of Erzhalden, led by Grand Jarl Copin Bälen, has been the home of Clan Bälen and its sworn clans for centuries. The duchy itself is exceptionally large due to the incorporation of lands retaken during the War of Many Banners. 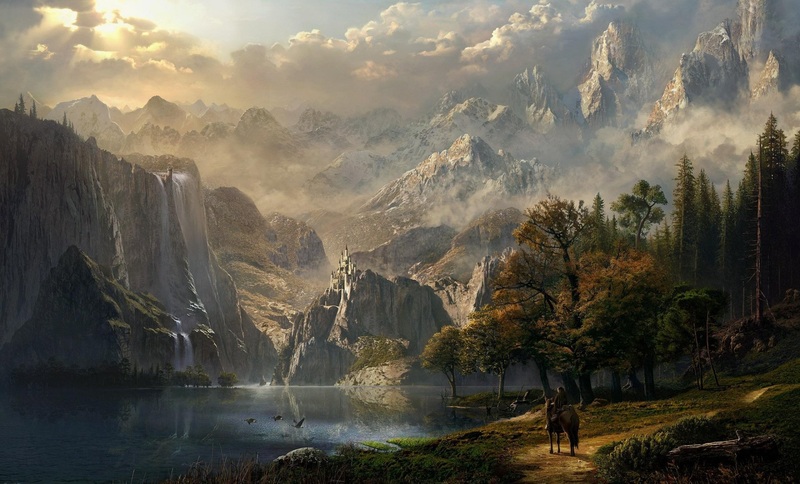 The inhabitants of the duchy have historically been fairly reclusive and have been holed up in the deep forests and mountains of the region that is now the Kingdom of Vornair. A bit rough around the edges, the Bälens are a hearty and friendly folk from unnaturally large stock. It is only just recently that they have joined civilization and become a prominent political force in the region. Initially, Erzhalden only encompassed a typical duchy-sized area. 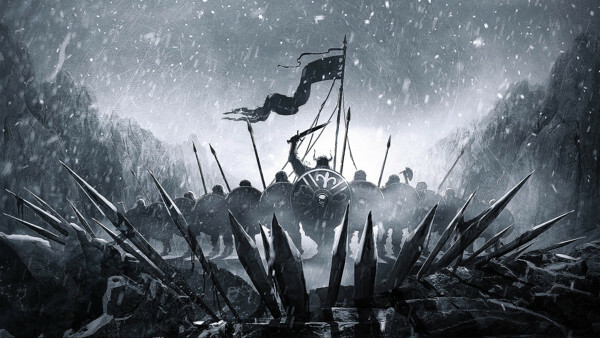 However, following the War of Many Banners, the Rhynes, after naming Copin Bälen I as Jarl of the area, subsequently rewarded Erzhalden for their major contributions during the war with a large swath of land taken back from the Empire of Xeilias. The people of Erzhalden were bred for war and have not forgotten what their fathers and grandfathers went through during the war against Xeilias. Members of the military of Erzhalden will be those who wish to continue this tradition of strength and make their ancestors proud. Additionally, due to their vast access to natural resources and land size, Clan Bälen and those that follow them have had resounding success in the areas of crafting and research. The current seat of power is the mountain stronghold of Bärenburg, an extremely well defended crafting hub which houses several major guilds. A Grand Duchy is a duchy that holds more than one Duke title. We currently hold three. As such, we'll ideally have more biomes, more counties for people to reside in, and more resources to exploit. That being said, if there is an issue of room come land selection where there isn't enough for my second duchy, I will be forced to sell for EP in order to accommodate the other pledged dukes. Novel shops/guilds (ones we don't have in a specific area and are in need of one), can apply interest free loans in addition to the land to create their ideas. Soldiers who wish to join will receive free training and housing and eventually a plot of land for your services. The nobility and aristocracy will receive duchy support in defending your reputation and land, as well as any pre-approved aggressive action. Additionally, you will have access to the technology that the duchy-level guilds research. We run on a system of character lifetime meritocracy. Each character has the potential to lead. If one of the council members dies, they do not automatically retain their position on the council. The position will be bequeathed to another senior character, at which time they'll continue in that position until they are removed by the Grand Jarl, or their character dies. We have two main goals as a duchy: Knowledge and Strength. As such, we will be looking for people who have a strong drive for research, and those with the capacity to utilize that research. Knowledge is defined by this duchy as being technological advancement in crafting. We will be a major guild hub with guilds for almost every craft. Our goal is to be the finest researchers that Elyria has to offer. Strength is defined by this duchy as meaning a strong and active military ready to meet any threat. While not aggressive by nature, but any attack will be mercilessly countered using every resource available to the duchy. 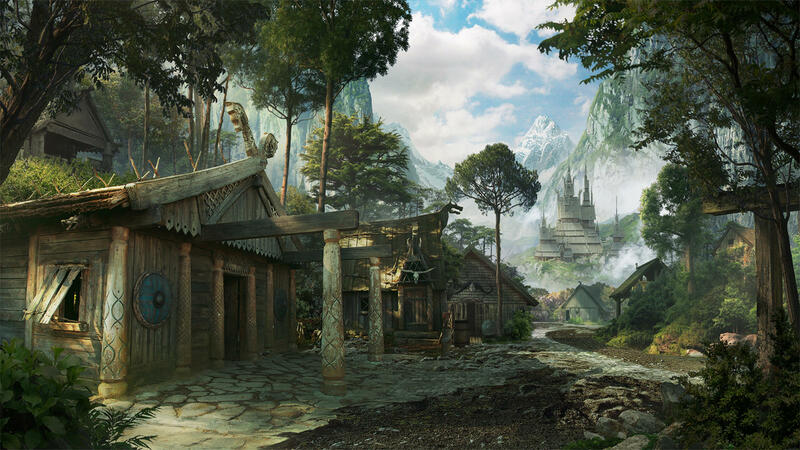 Additionally, we will need traders, adventurers, and any other type of play-style you can think of to make this a successful area of the world. 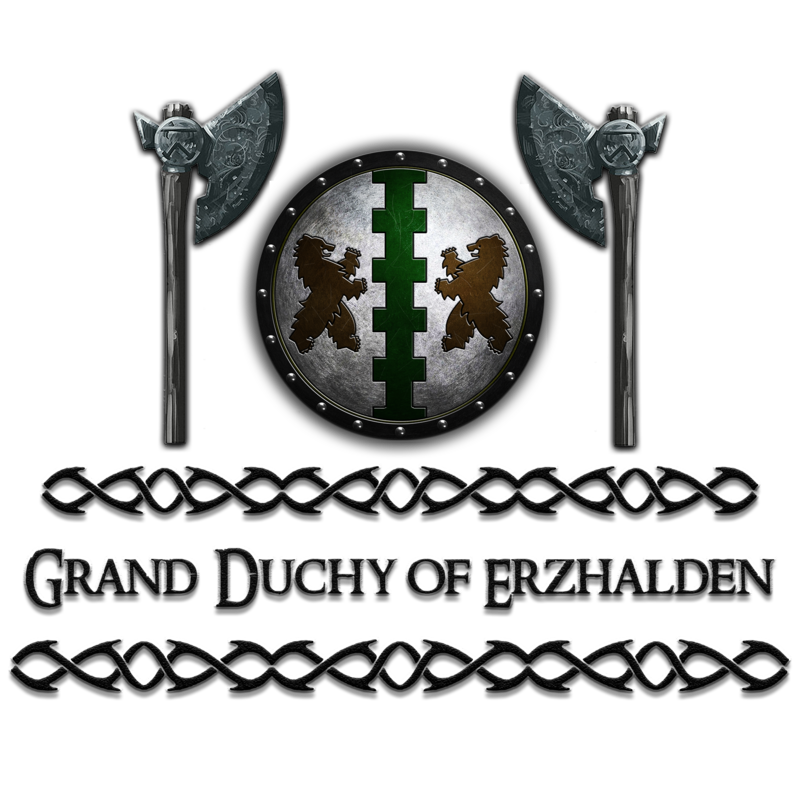 The clans of Erzhalden have a norse or germanic theme. Because of this, the preferred biome for the duchy will be Mountain Forest, and with the second duchy, will ideally include coastline and some plains for farming. If the norse or germanic theme isn't necessarily something you're interested in, you may still be able to find a place. The theme is not forced in any way. With two duchy choices, it should give us a better opportunity to meet all the citizens' needs. As mentioned earlier, the warriors of Erzhalden are some of the finest in the Kingdom of Vornair and as such, will be extremely busy. They have always been engaged in some form of conflict, internal or external. We will be using the tech advantage we gain from the guilds system to equip our military with the best equipment available. In peace, the military will maintain order and find new lands so we can continue to grow. In wartime, we will stand alongside the King in defense of the Kingdom. To that end, we are seeking players who enjoy focused and organized PvP (or PvE for taking out the NPCs) experiences. Ideal candidates will be self sufficient and adaptable, but also respect the chain of command and current goals of the duchy. Those who demonstrate their loyalty and competence will be rewarded for their services with new lands, titles, and wealth. Grand Jarl - Leader of the duchy. Supreme Commander - Typically the Grand Jarl is in this position. However, if the workload becomes too great in times of conflict, the Grand Jarl will appoint a temporary Supreme Commander to make sure organization is kept at maximum efficiency. They would oversee strategic implementation of the entire military force in times of conflict. Grand Marshal - Leader and top position of the Army of Erzhalden. Potentially oversees multiple armies. General - Top position in an army. If there is only one army, the Grand Marshal will also cover this position. In charge of 3 Battalions, which makes 1 army. Captain of the Horse - Subordinate to the General. If the stretch goal is reached for mounted combat, this position will be in charge of the Cavalry (Light, Heavy) aspect of the army their assigned army. In charge of a Battalion. A Battalion consists of 3 Companies. Captain of the Missile Corps - Subordinate to the General and in charge of the missile (Bow, Crossbow, Javelin, Thrown Axes, etc) aspect of their assigned army. In charge of a Battalion. A Battalion consists of 3 Companies. Captain of the Infantry - Subordinate to the General and in charge of the Infantry (Light, Heavy) aspect of their assigned army. In charge of a Battalion. A Battalion consists of 3 Companies. Note: Counts who wish to join the army will begin at the Captain rank. Lieutenant - Subordinate to a Captain, the Lieutenant will be in charge of a group from one of the above listed sub-categories (Heavy Infantry, Light Cavalary, etc). They will be in charge of a Company. A Company consists of 3 Platoons. Lieutenant of the Engineer Corps - One of the special groups in the military, the Engineer Corps will be in charge of Siege Engines and also defensive structures. A lieutenant will be in charge of this element of the army they serve. Lieutenant of the Ranger Corps - One of the special groups in the military, The Ranger Corps will consist of Scouts and First strike teams. A lieutenant will be in charge of this element of the army they serve. Note: Barons who wish to join the army will begin at the Lieutenant rank. Master Sergeant - Highest enlisted rank in the army and leader of a Platoon. They will oversee the day to day operations of their Platoon. A platoon consists of 3 squads. Sergeant - The baseline enlisted role of the army after they complete their training. They are the workhorses of the army and will be asked to perform many different duties. Will be the leader of a squad of NPCs. Recruit - This role will be for people who have just joined the army. They will be required to raise their skills to a certain point, at which time they will be promoted to the rank of Sergeant. Note: Everyone who serves in the army is capable of climbing the ranks to the top. Nobility get a boost due to their noble birth, but that does not mean non-nobility is incapable of surpassing them. Fleet Admiral - Leader and top position of the Naval Forces of Erzhalden. Potentially oversees multiple fleets. Admiral - Top position in a fleet. If there is only one fleet, the Fleet Admiral position will also cover this position. They will typically command the largest class available to the navy at the time. Will be in charge of 1-3 Captains. Merchant Admiral - Top Position in a Merchant Fleet. The Merchant fleets would cover the transporting of cargo, as well as people, from one place to another. They will typically command the largest class of ship available to the merchant navy at the time. Will be in charge of 1-3 Captains. Captain - Position subordinate Admiral or Merchant Admiral. They could be the first mate on the Admiral's ship, or have command of their own ship. If in command of their own, they will have one of the larger classes of ships. Counts who wish to be part of the navy will begin at this rank. Will be in charge of 1-3 Lieutenants. Lieutenant - Position subordinate to Captain, Lieutenants will likely either be the first mate to a Captain, or have command of a smaller vessel. Barons/Mayors who wish to be part of the navy will begin at this rank. Will be in charge of multiple Senior Crewmen. Senior Crewman - Top enlisted rank in the navy. They will oversee the day to day operations of the ship they serve on. Will be in charge of multiple Crewmen. Crewman - The baseline enlisted role of the navy after they complete their training. They are the workhorses of the navy and will be asked to peform many different duties while serving aboard their ship. Will likely have NPCs under them to control. Crewman Recruit - This role will be for people who have just joined the navy. They will be required to raise their skills to a certain point, at which time they will be promoted to the rank of Crewman. Note: Everyone who serves in the navy is capable of climbing the ranks to the top. Nobility get a boost due to their noble birth, but that does not mean non-nobility is incapable of surpassing them. Bearguard Commander - In command of the Guards/Town Watch of the Capital. Grand Jarl's Personal Guard - Will consist of the personal guard of the Grand Jarl. City Watch Lieutenant - Subordinate to the Guard Commander. They will be in charge of a few Sergeants. City Watch Sergeant - Subordinate to a Lieutenant, the sergeant will have a few NPCs under their direct control. City Watch Recruit - This role will be for people who have just joined the city watch. They will be required to raise their skills to a certain point, at which time they will be promoted to the rank of Sergeant. Note: Counts or Barons who wish to join the city watch or personal guard will begin at the Lieutenant rank (rare in either case due to their own commitments to their own city/county). Spymaster - In charge of the Agents of Erzhalden. The spymaster will provide them with their orders. Agents - Each Agent will have their assigned role/specialty. These orders will be given by the Spymaster. Most Agents will be unaware of fellow agents. The crafting guilds of Erzhalden will be an official duchy-wide supported operation. Within our system, each guild will have a guildmaster who will work with the Duchy's Guild Overseer (Council member) who will then facilitate the sale of goods through the merchant's guild. This includes internal and external sales. The system will also allow for each individual to earn profit based on their current rank and contribution towards a specific goal, as well as earn individual profit by fulfilling personal work orders. Guildsguard: Guards the Teamsters and any guild related caravan. Teamsters Guild: The transport service of resources from point of collection to the nearest guild warehouse. Also may shuttle partially completed products to their end destination. Banking Guild: Will handle the minting and banking system of the duchy-level system. Erzhalden Revenue Service: Handles the taxes of the duchy and managed by the Steward. These groupings are not final and is only an example of the organizational structure that we want to have. Obviously, there will be some overlap between many of the professions, and many guilds may share certain professions within their guild. This overlap also allows for more people to feel they are contributing in a meaningful way. For example, carpenters will likely need to be available for the Smith's Guild, the Bowyer's Guild, and the Guild of Builders. A new carpenter can choose any of these guilds to join and focus on that specific aspect of carpentry. If one guild is a bit overcrowded with carpenters, they can always move to another and contribute more, and potentially have better revenue generating opportunities. They also have the same ability to rise in ranks within their respective guilds as any other member even if that specific guild is the only user of that profession. This also gives some variety for characters in different lifetimes to try new things regarding their craft. 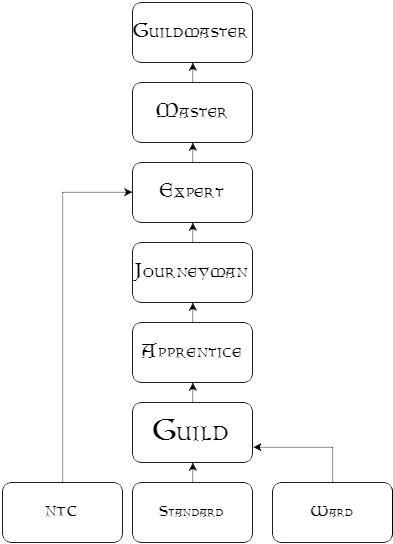 This means with a Guild of 20 people, there would be 4 Apprentices, 12 Journeymen, 3 Experts, 1 Master, 1 Guildmaster. The reason for only 1 Master is that the Master is in a way the defacto "successor" to the Guildmaster title. However, if enough people have joined, this would add a second Master. Rank increases are completely merit/skill based. If two Masters are competing for the Guildmaster position, they will be judged purely on their contributions to the Guild as a whole, and their skill in the specific craft they have focused on. However, one of the Masters may decide (if the opportunity is available) to become the Guildmaster in another chapter of the guild, which would then allow the other Master to become the Guildmaster of that extra chapter of the guild. Masters: Masters will be responsible for handling the highest quality of work orders (Ex. Weapons and armor for the King's Guard) as well as dictating the research paths the guild will be going down (with approval by the Guildmaster of course). Masters are also the only ones eligible for election into the Guildmaster position. Experts: Experts have been around long enough that they should be able to handle most of the guild's available techniques and blueprints. Non-traditional characters that demonstrate appropriate skill start as experts as they should have the skills during their NTC training to be at this level. Experts will fill special higher-end contracts (Ex. Higher quality weapons or armor than the base level) as well as contribute a large amount of their time to guild research. Experts also will be responsible for most of the training of Apprentices. Additionally, Experts, like Journeymen, may fulfill personal contracts for customers. Journeymen: The workhorses of the guild. These members have become proficient enough to contribute to research as well as most of the work orders the guild receives. Journeymen may also begin to fill personal contracts (a personal request from a customer). They may purchase materials to fill this personal service at cost. The profit from this transaction is outside the guild and directly into the Journeyman's pocket. Apprentices: The lowest rank of the guild. This is for brand new characters with almost zero skills. Their main goal is to train. They will also begin to help some of the basic work orders that they can manage with their low level of skill. Ex. a Blacksmith making some nails (assumed a low skill level requirement). Note: Further percentage splits would occur if there is an uneven amount of members in a specific rank or if the number of contributors for an order is low. For the sake of clarity, only people who have put in the work towards a specific breakthrough or sale will gain the profit from that transaction. So for example, if there is a large bulk sale of Armor in the Blacksmith's guild, Weaponsmiths belonging to the same guild won't get any portion of that profit as they likely wouldn't have contributed to the production. This allows for greater profits for the individuals involved. Additionally, the Merchant's guild in this instance would be working as the logistics wing of the operation. They wouldn't be marking up these goods because they would be pre-approved contracts and their fees for transport and safety of the order would be included in that contract. Lastly, all bulk orders must be done through the Duchy's Guild Overseer. Every member of the guild will have the ability to fulfill personal orders. Ideally, each guild will have multiple storefronts in the city and counties in which they reside where they can take orders from citizens. These would likely be small to medium orders, such as a personalized sword or perhaps they need some wooden planks for the construction of a house they're building. Any guild member will be able to take these orders. Depending on the quality and budget of the person ordering, a guild member of a more appropriate may be required to take the order instead. Someone may have a budget of 100 gold but a Grandmaster quality sword is selling for 200, so they may have to find a Journeyman or Expert to fulfill this order for them. As before, the Merchant's Guild would act as logistics in this capacity to get the goods to the shop fronts. Their fee for transport, if required, would be included in the final price to the customer. Personal Orders like this do not require Guild Overseer approval or supervision. The last path for profit in our system is via members of the Merchant's guild. In the last two paths they acted only as the logistics arm of the operation. However, because of their membership, they will be afforded the opportunity to buy goods directly from the Guilds at a much lower price than market price (not low enough to be a loss to the guild itself). They will then be free to move these goods wherever they wish inside or outside the Kingdom in order to turn a profit. The price is paid, in full, up front by the Merchant's Guild member to the guild with which they are doing business. Any profit after that is the Merchant's to keep. This allows them freedom to keep their wagons stocked with whatever they feel will be necessary at their destination. As with personal orders, Merchant's guild orders, due to being smaller in nature, do not require Guild Overseer approval or supervision. The Guilds' Overseer is the most important part of the bulk order machine. They will be the one to facilitate internal and external trading of large contracts. Intra-guild trading will be done with either a portion of the operating costs budget in that specific guild, or with direct trade in materials. All trades between guilds will go through the Guilds' Overseer office who will track all transactions. External trade will also be done by the Guilds' Overseer, who will move the goods to the Merchant's Guild who will then facilitate (and transfer) the final sale. In the case of large orders like this, the Merchant's guild is strictly a logistics wing and will be paid a base price for their transport and protection of the order. Additionally, the guilds themselves will be tax exempt. Due to the duchy taking a percentage of profits, and it being supported by the duchy, it seems excessive to take taxes. However, this does not mean its members are tax exempt and all members of the guilds will be taxed like any citizen of the duchy. Furthermore, this system is NOT mandatory. 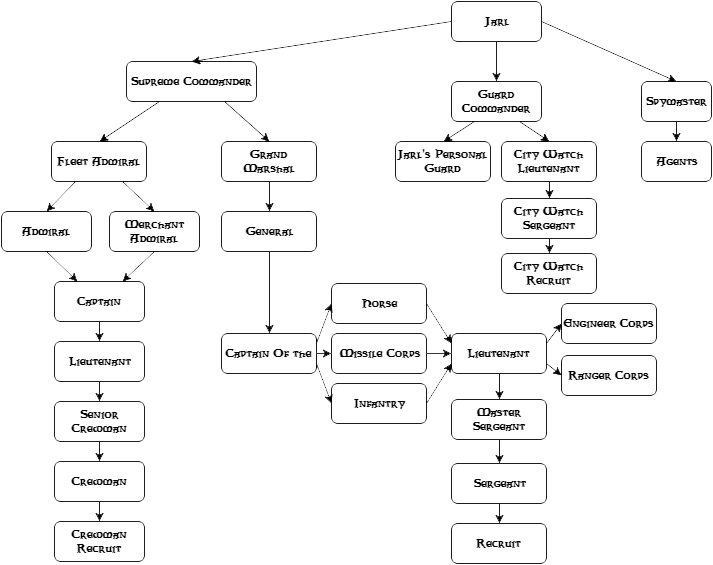 This is just a system in which people can help the duchy directly and work together as a group. If you wish to join as a free market guild, then you are free to do so just as you would in any other location. There will be no sanctions or negatives other than having to compete with the duchy-backed guilds. When all is said and done, the Guilds of Erzhalden want to be a safe place for training the future crafters of the duchy and the kingdom. All of the things a new crafter needs will be provided to them in the guilds. As a new player, or anyone involved in crafting, there are a ton of advantages to join our system. You'll have room, board, be paid for your contributions to the guild, have access to free crafting facilities to sell your personal wares, and get materials at a discount. You'll also have the benefit of having, in one duchy, the entirety of our duchies' resources available to support the guilds. However, if anyone at any time wishes to take the skills they learned and move somewhere else to make their own way, then they are free to do this. We are not in the business of keeping people in the guilds against their will. Technology Advantage - The main goal is to work together as a duchy in order to gain the best technological advantage as rapidly as possible, which will enable us to hold the patents and sell to others. Everyone benefits from the funds generated from these patents. Military - With the technology advantage, this will allow us to equip our military with the latest and greatest, thus making us a formidable force. Personal Profit - Even though the bulk orders will be serviced by the guilds, you will still gain a portion of that profit. Additionally, there are plenty of personal profit opportunities within the guild system that do not require a bulk order. Tutorial location - The last reason, and likely most important for most people, will be this is a place of learning. New players can start in our guild structure and learn as much as they want and contribute during their time. If they decide they want to set off on their own, they can take the skills they've learned and go elsewhere. All of this information is subject to change based on further information from Soulbound. 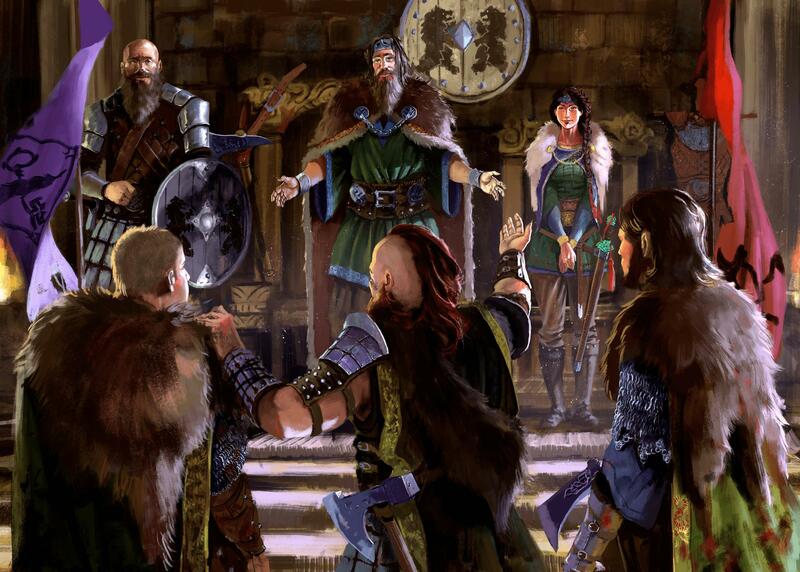 The current heads of the clan are Grand Jarl Copin Bälen, who has sworn fealty to the Kingdom of Vornair. Chancellor - in charge of foreign affairs. Steward - in charge of internal affairs and justice. Treasurer - in charge of trade, finance, and taxes. Guilds' Overseer - in charge of the crafting guilds of Erzhalden. Great Count of the North - the council representative of the Northern Counties. Great Count of the South - the council representative of the Southern Counties. Great Count of the East - the council representative of the Eastern Counties. Great Count of the West - the council representative of the Western Counties. Chronicler - in charge of the records of the duchy. Grand Marshal - In charge of the armies of the duchy. Fleet Admiral - In charge of the naval forces of the duchy. The government is run by the Grand Jarl with the help of the Council. Additionally, all major Grand Duchy-level decisions will be decided by a vote. Most economic decisions will be decided by a council vote, with the Countsmoot advising and being allowed to speak their mind regarding the issue at hand. All Duchy-level military offensive actions must be approved by majority vote in the Countsmoot. The Countsmoot is a voting body comprised of the Counts(Counts) of the Grand Duchy.